*Please note that the links to the content in this Part will direct you to Westlaw AU. If you are using Checkpoint, the links can be found in the Checkpoint PDF at the bottom of this post. To purchase an article, please email: LTA.Service@thomsonreuters.com or contact us on 1300 304 195 (Australian customers) or +61 2 8587 7980 (international customers) during business hours (Mon-Fri, 8am-6pm AST). While the law of vicarious liability has existed for centuries, a satisfactory rationale or explanation for it has proven to be elusive. United States courts began asserting a theory of “enterprise risk” based on economic principles, seeking to allocate the costs associated with doing business to the enterprise. On this basis, the fact that an employee or other worker commits a wrong, and causes a third party injury or loss, is a “cost of doing business” which should properly be allocated to the business activity. This doctrine has apparently been accepted in Canada and the United Kingdom, including seeing child abuse committed within an educational institution as effectively a cost of doing business. While the Australian courts at one point seemed to accept such reasoning, more recently they have turned away from it. This article argues the Australian courts were right to do so, and should continue to not accept such a basis of vicarious liability. 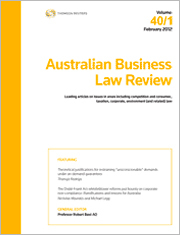 The Air Cargo case provided the first opportunity for the High Court to interpret the phrase “market in Australia” in s 4E of the Competition and Consumer Act 2010 (Cth). Unsurprisingly, this focus shaped the way in which market definition was approached. Yet, market definition in the context of the supply of air cargo services is of interest in its own right, especially as it highlights the issue of how to identify the relevant product supplied by the airlines and, as a transport service, illustrates how the product dimension of the market may incorporate a geographic element. It also highlights the overlap between the various dimensions of market. Having identified the origin and destination in a generic sense in relation to the product dimension, to identify the geographic dimension of the market the various judgments in the Air Cargo case should have considered the inter-changeability of routes and whether network effects might have created a global market. However, these issues received scant attention as they were subjugated to the discussion of application of s 4E. The judgments linked the functional dimension of the market to an important consideration in relation to “market in Australia” but did not (at least explicitly) define it. For the PDF version of the table of contents, click here: Westlaw AU – ABLR Vol 46 No 3 Contents or here: Checkpoint – ABLR Vol 46 No 3 Contents. For general queries, please contact: tlranz.journal.orders@thomsonreuters.com.